Having a hearty bowl of hot piping soup is the most comforting food one can during winter to ward off the cold. As I have mentioned before, I per say do not experience winter where I live. However at the moment I’m in Nairobi, the capital city of Kenya. Usually Dec to March is suppose to hot but the weather here is cold, though the sun comes out. My brother in law was teaching me how to make a sourdough bread(previous attempts have failed as the dough became too soft!) where handling the dough is much easier and the does not require too much kneading. He also has after much experimentation made the dough that fits the weather here. 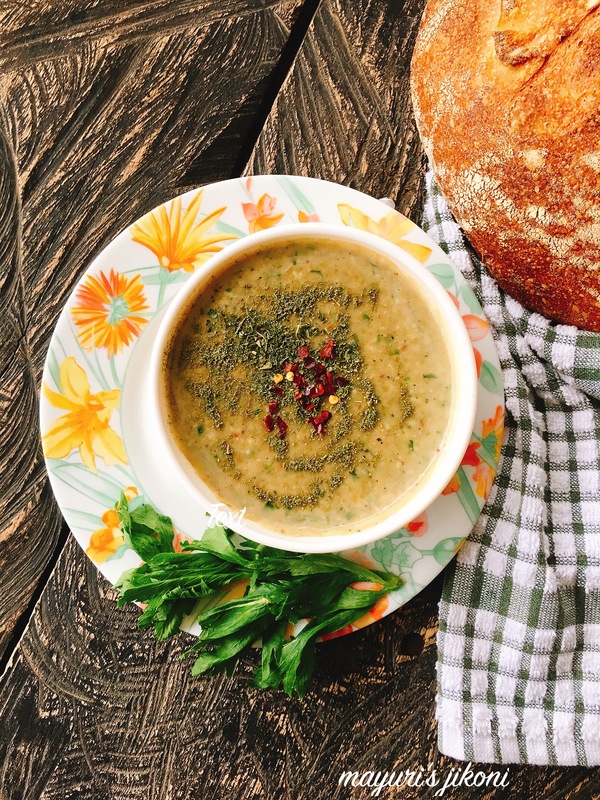 To enjoy the freshly baked sourdough bread, we decided to make a healthy hearty soup with the ingredients available in the house. That’s when I came up with the idea of making a moong and celery leaves soup. I have noticed that so many people throw away the really fresh green celery leaves and just use the stalk. I like to add them to salads, to soups and stir fried veggies. Initially I thought that combining green moong and celery leaves would result in a weird taste. However, surprisingly the soup was a burst of subtle tastes from all the ingredients used. Here in my recipe I have added powdered dried herbs. My brother in law tends to dry the excess herbs and then pulses them in a food processor to make it into powders. I found that the taste and aroma of the herb powders was much more than the dried whole herbs we tend to use. So lets get to the recipe straight away. The colour of the soup may not appear too appealing but its definitely a tasty, healthy and filling soup. One can add a bit of turmeric to alter the colour, without comprising on the overall taste. Soak the moong in warm water for 1-2 hours. Drain out the water and wash the soaked moong. Heat oil in a pressure cooker or a pan. Add cumin seeds and wait till they begin to sizzle. Add chopped onion and stir fry it till it becomes soft. Add garlic and ginger. Saute for a few seconds. Add moong, coconut and salt. Mix well. Add the water or vegetable stock. Close the cooker and let it cook over medium heat for 3 whistles. If you’re using a pan, then cover and let the soup simmer till the moong beans are done and soft. Add the celery leaves while the soup is hot. Cover the pan. After 5 minutes, process the soup in a food processor or with a hand blender according to the way you will like it. Leave it a bit coarse or make it smooth completely. Return the pan to the medium heat. Add the herb powders, pepper powder, chili flakes and lemon juice. Mix well and serve with some bread. Add a bit of turmeric powder if you like. If you want a smooth soup, puree and strain it. If the celery leaves have a strong flavor add only half cup. You can add other vegetables like peas, carrots, French beans etc. Thanks Vanitha, it is a comforting wholesome soup. The soup looks delicious . It’s comforting and soothing to have a bowl of warm soup to ward off the chilly days .Thanks for the lovely share. Ahh, there we go.I look for ways to do the celery leaves differently. now have one. the comforting recipe you have here. Thanks Seema, and the leaves impart a unique taste to the soup. A comfort soup for cold nights. It will be a perfect one for me any day as I like green moong. Wow what a brilliant share.. Great recipe. Looks so comforting , warm and tasty.. Thanks Ruchi and please do try it. What an interesting recipe!! The soup looks soooo delicious and comforting. Will definitely going to try this unique recipe. Thanks Shalu, please try it. What a comforting and delicious looking soup! The ingredients you have used.. I am just imagining the taste. Love the addition of coconut here. Great share!! Delicious and nutritious bowl of comfort!! The soup looks yumm Moong dal soup is light on stomach and easily digestible too!! Love the idea of drying and then preserving the herbs in powder form!! Thanks Swati, here I’ve used whole moong which I soaked for 30 minutes. Really love the way this soup looks. Recipe is interesting too! Need to make and taste it soon. Thanks Sujata, do try it out, its really tasty. What a hearty soup recipe Mayuri. It looks so inviting. Such a wonderful share. What a hearty and delicious soup for a chilly days, moong and celery leaves a strange combo but certainly works here nicely. Thanks Jagruti as strange as it may sound, the soup was really delicious. I think using celery leaves in a soup like this is a great way of avoiding food waste. It sounds really tasty and definitely something I’d enjoy! Thanks Corina, yes I don’t like food waste. I tend to use the leaves up if they’re fresh and green. This soup would be perfect for today when the temperature is -3!! Moong is one of my favourite lentils and adding celery to it sounds perfect. Thanks Mina, didn’t realize its become so cold in UK. This soup looks so warm, flavorful, and healthy! It is perfect for a chilly night. Can’t wait to try it. I bet the aromas in this soup are to die for! Your kitchen must smell amazing! Thank you so much Lesli, the taste and aroma both were good. YUM! Love all the flavors in this. I”m sure this would be a big hit at dinner. Can’t wait to try. What a gorgeous looking soup, some of those ingredients are unfamiliar to me, but all the more reason to try this – it sounds delicious! Thank you so much.Most of them are easily available in Indian or Asian shops. Looks like a lovely mix of flavors. Soup and fresh bread are so good, especially on a cold day. And agree, celery leaves can be wasted – I tend to add them in stock – and this is a great use for them. Thank you so much Caroline. Even try them in salads, they taste great, especially the tender ones. Thanks Lizet, please share with me how it turns out for you whenever you make it.